Bridal clients love Pocket Wedding Invitations! Carlson Craft has designed a Pocket Wedding Invitations Album called “Pockets” Wedding Invitations with all kinds of pockets and inserts to go along with it. This example illustrates a popular pocket wedding invitation style for Fall Weddings. 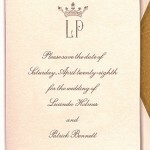 The jacket is copper shimmer, the wedding invitation is in ecru mounted on a black backing with chocolate ink color. The look is complete with leaves motif on the tab with the couple’s names. The pocket inserts include Map Card, Accommodation Card, Reception Card and Response Card. Above is an example of the Map Card, for Pocket Wedding Invitations, which is inserted in the pocket invitation. The invitation set can be completed with more inserts depending on the couple’s request. For Example a couple having their nuptials in San Francisco could design a Map Card with San Francisco Directions. Other popular pocket jacket colors include Teal Shimmer, White, Ecru, Latte Shimmer. Popular ink color combinations include Pewter and Raisin, Chocolate and Latte, Ebony and Scarlett. Prices for 100 invitations with outer envelopes is $380. For more designs, color combinations, pricing and online order please see our website at Shop Online. To see the pocket invitations in person come in to our San Francisco Store where we can help you with the design process. Don’t forget to get Digital Calligraphy for your addressing at Hyegraph Embarcadero San Francisco for $1 an envelope.